This position is located in the Exhibitions Office, Smithsonian American Art Museum. The employee provides a wide range of technical advice and services related to the exhibition, acquisition, and preservation of media arts and archives. Works with Curatorial, Exhibition and Registrar staff to plan the application and installation of media art exhibitions and installations. Coordinates research, documentation, planning, development, production, and gallery installation. Works with staff to elucidate, document and manage the physical care of the Museum’s various media arts archives as well as the collection of technical components related to media arts at the Museum. Provides research on proposed acquisitions including equipment needs, technical specifications for display, and long-term maintenance and storage. Assists in the production of exhibition-related films, videos and video treatments, as well as computer inter-actives that are part of permanent gallery installations and temporary exhibitions. Develops concepts into coherent proposals or treatments, prepares budgets, determines appropriate formats, collaborates on storyboards, and sets the production schedule for a variety of media projects. One year of full-time experience at the GS-11 level that is close or similar to the work of this job. The experience includes activities such as researching, identifying and documenting film, video, audio, computer, inter-active and electronic based artworks; evaluating condition and viability; converting to stable, long-term storage media; planning and implementing installation in exhibitions; preparing user guides and instructing others on installation, exhibition and preservation of media artworks. Knowledge of media arts technology and media artists. Skill in project management, including coordination of deadlines, budgets and staff or contractors. Skill in written communication for preparation of technical instruction and documentation. Knowledge of collection management practices of media arts. Ability to create, produce and edit media components for exhibitions. Your resume should provide detailed information regarding how your education and experience relate to this position, including the major duties and qualifications criteria listed.To preview questions please click here. Click on the “Apply Online” button on the upper right side of the page. You must apply for this position online through the ‘Apply Online’ button. Clicking the “DONE” tab does not submit your application. The “DONE” tab allows you to exit the system and save your information for completion at a later time. To submit your application, click the “FINISH” tab. Unofficial school transcripts, if the position has an education requirement. You will receive an e-mail to acknowledge that your application has been received. Please be aware that the confirmation e-mail could reside in your “junk” or “bulk” mail folder depending on your filters. The Smithsonian receives many applications for each job. Each application is reviewed carefully which may take a few weeks. We will send you an e-mail to update you as we go through phases of the application review process. You may also check your application status by logging into http://www.usajobs.gov and selecting the tab “My USAJOBS;” e-mailing vacancy.info@si.edu; or by contacting the Office of Human Resources Representative listed. Interested in Becoming a Ragin’ Cajun? Join The Courier’s team as a multimedia photojournalist in south Louisiana’s unique bayou country in Houma and Terrebonne Parish. Photographer will cover a wide range of assignments shooting both still photos and video. We’re a community-based newspaper, circulation just under 20,000, owned by the New York Times Co., with competitive salary and great benefits. You’ll be shooting some of the biggest assignments we cover, including hurricanes, Mardi Gras and New Orleans Saints football. Your work will appear in print and on our website, houmatoday.com. Requirements include a four-year college degree and knowledge of common still and video photography equipment and software, including Adobe Photoshop and Adobe Premier Elements or similar video-editing tools. We’re looking for someone with a great eye with a strong desire to put the camera lens where the action is. Previous experience at a daily newspaper preferred but not required. We are a small, close staff, and ours has been named Louisiana Newspaper of the Year 10 of the past 12 years. Come join us in covering a unique community in Cajun country, an hour southwest of New Orleans. Send resume and digital photo and video samples to: Karen Dauzat, Human Resource Director, P. O. Box 2717 Houma, La. 70361 or e-mail to karen.dauzat@houmatoday.com . You may also apply on line at houmatoday.com or dailycomet.com scroll down and click on Work For Us. Here is a very interesting map, created by Eric Fischer. Using the same technique and data set as this map of Chicago by Bill Rankin, Fischer mapped several American metropolitan areas. 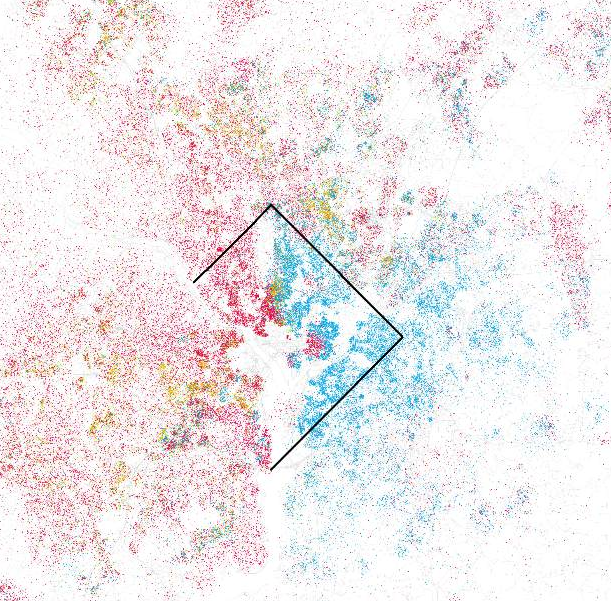 Each dot on the map represents groups of 25 people, colored by their self-identified ethnicity in the 2000 Census (red is White, blue is Black, green is Asian, orange is Hispanic). DC is outlined in black. Knight Foundation is bringing new support for the Philadelphia arts through a community-wide contest that funds the best ideas for the arts in the city. Applications for the Knight Arts Challenge Philadelphia will be accepted beginning Oct. 5 at KnightArts.org. Anyone can enter the Knight Arts Challenge Philadelphia – established arts institutions, independent artists of all types, businesses, service organizations, and any individual who has a great idea for the arts. The initial two-question application is designed to be simple to encourage applicants who aren’t traditional grant seekers. We’re looking for the most innovative ideas in the arts that both inspire and enrich Philadelphia’s communities. The Knight Arts Challenge began in 2008 in Miami, where the initiative is now in its third year. Philadelphia is only the second city in which Knight is offering this program. Knight Foundation will offer up to $9 million there over three years. Would you be interested in working with Smithsonian scholars and collections to inform your artistic practice? Nominations are now being taken for the Smithsonian Artist Research Fellows. This program is entering its fifth year and offers visual artists the opportunity to spend one to three months working with Smithsonian collections and scholars. The SARF program is unique among artist residency programs, offering, instead of a studio, a dynamic research environment in which to investigate the objects, discoveries, and historical events that inspire creative work. The program brings artists together with Smithsonian experts in a variety of disciplines at museums and research centers in the United States and abroad, to explore cross-disciplinary connections between history, art, culture, and science. There is no comparable fellowship program in the United States, and it is right in line with our new Smithsonian Strategic Plan. SARF fellows are chosen by a panel of SI art experts with input from representatives from the SI history, culture, and science research communities. Fellowship terms are one to three months and for FY 2011 must begin between June 1, 2011 and March 1, 2011. Nominated applicants will then receive an application which must be filed by December 1, 2010, and will be notified of decisions by March 15, 2011. APPLICANTS ARE STRONGLY ENCOURAGED TO OBTAIN AN SI SPONSOR/ADVISOR BEFORE FILING APPLICATIONS WHO WILL BE WILLING TO ADVISE THEM DURING THEIR PROJECT. For further information on the program, SARF 2010 guidelines and application form are available on the Office of Fellowships’ site at http://siofg.si.edu/Program/SARF/SARF.htm. If you are interested in applying send me an email, and we’ll talk! I love this idea of trading prints. A bit of good advice I got on a visit to New Orleans by A Gallery for Fine Photography’s Josh Mann Pailet (a most charming man and incredible resource, I send everyone I know going to New Orleans Josh’s way) was to trade prints with your fellow artists. Thus I love this call for entries by Mass MoCA in the spirit of Sol LeWitt who traded prints with everybody and anyone regardless if they were as well known as he was. It’s good karma, and there is no reason for all that stuff to sit in your flat files, especially of those of you who have open editions and editions of 200. The story of Sol LeWitt’s exchanges with other artists is by now widely known. Though most artists engage in this process at one point or another, LeWitt seemed fully committed to it as an artistic code of conduct, a way of life. Eva Hesse, Robert Mangold, Hanna Darboven, and Robert Ryman are just a few of LeWitt’s celebrated contemporaries with whom the artist exchanged works. Such exchanges were not limited to well-known artists, however: LeWitt consistently traded works with admirers whom he did not know but who had nevertheless sent their work to him, as well as amateur artists with whom he interacted in his daily life. LeWitt’s exchanges—he responded to every work he received by sending back one of his own—fostered an ongoing form of artistic communion and, in some cases, a source of support and patronage. The Sol LeWitt Private Collection retains all of the works he received, as well as a record of what he offered in return. For LeWitt, the act of exchange seemed to be not only a personal gesture, but also an integral part of his conceptual practice. In addition to encouraging the circulation of artworks through a gift economy that challenged the art world’s dominant economic model, LeWitt’s exchanges with strangers have the same qualities of generosity, and risk, that characterized his work in general. This kind of exchange was designed to stage an encounter between two minds, outside the familiar confines of friendship. If we consider the process of exchange as another of Sol LeWitt’s instructional pieces, then the rational (or irrational) thing to do is to continue to exchange work and ideas, if only symbolically, with him. A publication documenting the contributions will accompany the shows and will be presented at the conclusion of the project to all participants. Please note that we cannot return your contribution. You can, however, pick it up at the end of the exhibition if prior arrangements have been made. It constantly amazes me how galling is the double-standard practiced by our elected “leaders.” Many of you will know that Congress is considering enacting a law that will require all who purchase more than $600 in goods or services to issue a 1099 form, a form us freelancers are very familiar with as we tally our year end earnings at the end of the year. I shudder to think how much my accounting will cost as I tally up all my goods and services paid for at the end of the year. ASMP is leading the charge to fight this proposal here. I highly advise you to check it out. What is even more risible, in a haha it is not that funny way, is a WSJ article detailing the fact that Congressional leaders whilst on their taxpayer-funded overseas junkets routinely receive a per-diem, as high as $250/day in one part of Japan, and often ask for a $50 per day supplement. But guess what? They don’t need to submit receipts. Obviously they have never worked for an editorial publication ; ) I guess that is just too much for them. Needless to say the WSJ article goes on to talk about how members routinely use their per diem (often unneccesary thanks to their hosts providing them with ample food and libation) to purchase gifts like marble candlesticks and other what not. Buy American clowns! It is this kind of hypocrisy that always stuns me about Congress and makes me want to be a conscientious objector in paying my taxes. I do pay my taxes, IRS, yes quarterly, btw. I will use my blog to object. At Dallas schools, where 86% of the student body is low income, plenty of students would have been eligible for the Black Caucus scholarships, which require a 2.5 grade point average, said Sylvia Lopez, director of counseling services for the Dallas Independent School District. But she says no one has ever contacted her office to alert her of the scholarships’ existence. While I’m on my soapbox, how about reinstating the estate tax? I think 3.5 million tax free per person is sufficient to avoid paying the so called death taxes. If the government is so concerned about generating revenue, why don’t they do it in a way that is less painful to the greater good, though I am sure my accountant will love billing me for those 1099’s. Yeah, my heirs won’t be worrying about any estate tax. The CPA already got it.